The map that is picture of the day shows an overview of glaciation. The sea level was 120 meters lower. The continents were larger. Maximum glaciation was in the northern hemisphere, this is because the land area is greater in the northern hemisphere. The North American glaciation was larger than the European. The whole earth was cooler in the tropics, the temperature was 3-4 degrees lower. The tropical rain forests of the Amazon and the Congo was significantly less. In Southeast Asia, the difference was not so large because the land mass that was larger. Persian Gulf, the North Sea and the Yellow Sea did not exist. But it was a "ditch" between Asia and Australia. Deserts were much larger. In Australia, the drying up of the continent was so severe that about 80% of the people died. Among the earth's coral reefs were the mass deaths. For the Earth's ecosystem the ice age was a strain. The Arctic areas was extremely large. The ice age was no successful period in earth history. For more than 10,000 years ago, we got a heating up so fast that the climate change led to the large so-called Ice Age animals became extinct. For an example, the woolly rhinoceros. This Wikipedia article says that "The 3.5-meter-long animal was exposed early to hunting by man, which perhaps led to its extinction, although no one can say for sure. 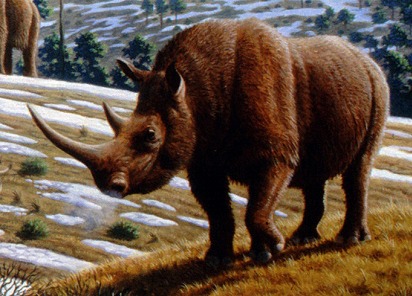 Woolly rhinoceros was hunted even by Neanderthals. It was confirmed by findings in cave ofGudenus in Lower Austria. where species disappeared about 10,000 years ago. The youngest known fossils are 8,000 to 10,000 years old, found in Ukraine. Finds from the cave Kesslerloch in Switzerland confirms that the species which lived on for 12 - to 14 000 years ago. " Man is hinted to be the one that was the reason that this animal died out. Our textbooks are even more confident about this. More recently, they have found a skull of a rhino 3.7 million years old on the Tibetan highlands which led to a theory that the rhinos evolved in Tibet and was originally adapted to cold climates. The great horn the animal maybe used as a snow shovel. One of the researchers says "Cold places, Such as Tibet, Arctic, and Antarctic, are where the most unexpected discoveries will be made in the future," said Xiaoming Wang from the Natural History Museum of Los Angeles County. "These are the Remaining That frontiers are still largely unexplored." The research article was titled "Extinction chronology of the woolly rhinoceros Coelodonta antiquitatis in the context of late Quaternary megafaunal extinctions in northern Eurasia." The rhino was fully adapted to the tundra climate the article says "an animal adapted to feeding on low-growing herbaceous vegetation and a dry climate with minimal snowfall." Researchers have tried to follow how this animal gradually as a result of climate change become extinct. It does not seem to have found their way back to Tibet. Heating made the treeless landscape with minimal snowfall disappeare gradually. It is also said that "Its final extinction probably Relates to Lateglacial interstadial warming and Increased precipitation (especially snowfall) accompanied by the replacement of low-growing herbaceous vegetation by shrubs and trees. 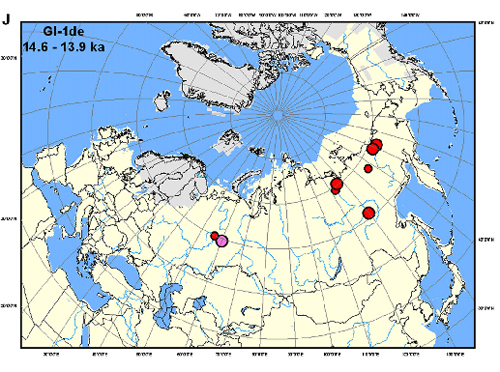 The survival of woolly rhinoceros in northeastern Siberia When it had disappeared Further west May related to the lateral persistence of open vegetation in That Region. 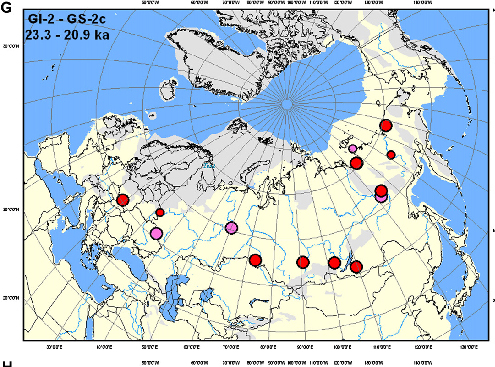 The timing of its final extinction could related to the fact That the Lateglacial interstadial was Significantly warmer than any other event in the previous 50 millennia. " That one can find that the sparse befolningen at the time, sometimes hunted rhinos does not mean that man was the cause that this cold-adapted animals disappeared. The following maps shows the distribution at different times. More maps are available in the research report. Places with rhino fossils older than 46 000 years. Color differences on the rings has to do with security in time datings. 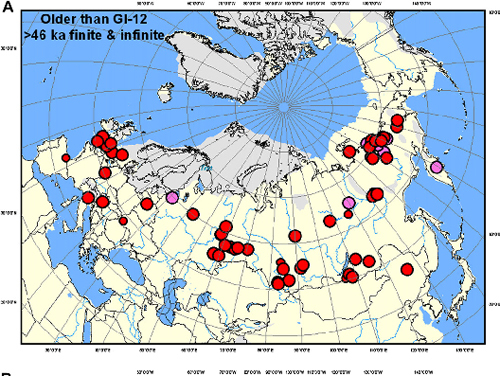 Fossil finds when ice age had its maximum. Fossil finds at the end of the ice age. In Siberia the environment suitable for rhinos lasted lasted the longest.